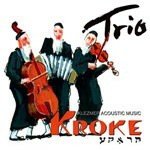 The music of Kroke has its roots in Hebrew and East European tradition, in the psalms and synagogue music played during services. It is a very specific and energetic music, in which the elements of the Orient and the Occident are merged, and whose range of feelings oscillates between unbridled joy at one extreme and the deepest melancholy at the other. A special feature of Kroke is the technical perfection with which they wield their instruments. This is their weapon with which they transmit their feelings, making them reverberate in fascinating sounds. Stránka vygenerována 22.4.2019 v 21:07:50 za 0.186 sekund.